Only a handful of life’s moments can beat the feeling of sitting in a brand, new car that you just purchased. 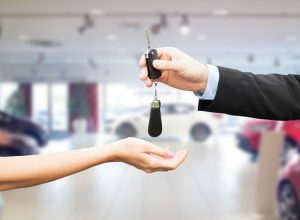 Although the process of buying a car can be long and strenuous (for both the salesperson and the buyer), the payoff is well worth the trouble. Look around any well-established dealership and you’ll see more than just a parking lot of sparkling vehicles and the dancing, inflatable balloon man. What really keeps the motor running behind the scenes are the people that work there. 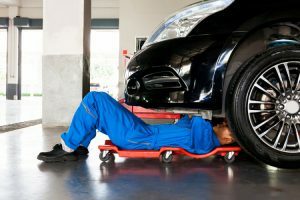 From the sales team greeting guests in the parking lot to the mechanics getting their hands dirty in the auto shop, each individual is a key component to making the dealership function efficiently. Standard uniforms for each position vary by dealership. Customized and professional attire for your employees can jump-start the team-cohesiveness that your customers will immediately see. A typical car dealership will employ many people of varying positions. The first interactions when a customer walks into a lot is with either a member of the sales team, a manager, or a receptionist. A professional, button-up shirt with the company logo printed on the front is a great way to portray a knowledgeable and welcoming staff. Another important part of the car dealership staff are the hardworking individuals maintaining the vehicles. This includes mechanics, car detailers, and porters. Employees in this position will still want to look respectable but require uniforms that are more functional to their duties. Darker uniforms with a collar that are easy to change into or take off are some characteristics to look for when choosing attire. Depending on the extensiveness of the work your auto body shop provides, you may also want to consider a laundry service to keep your employees in fresh uniforms on a daily or weekly basis. 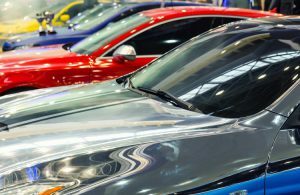 The finance and insurance managers may or may not be dealing with the customers face-to-face, but it is still important that they are in tune with the rest of the dealership’s continuity. The uniforms for these managerial positions can match that of the sales team or exceed them by one step in professionalism. A tie can be added to the shirt or a jacket worn over the shirt. Either way, it is still a good idea to have a form of the brand logo on the attire, even if it is subtle. Uniform Nations is a free service that connects your company with local uniform contractors, including rental, laundry, and delivery services. We have specialized uniform providers who have experience working in the automotive industry. Customized uniforms for auto dealerships can be found here. Uniform Nations is your resource to finding local uniform providers that have validated experience in just about every industry. We find contractors and offer you their quotes to choose from, completely free!